More than a few people have suggested to me that maybe I should get a life. The energy and enthusiasm I devote to things like bike racks and way-finding signage strikes them as a bit over the edge. They’ll be recommending that I seek professional help after reading this latest post. It’s about freshly painted crosswalks and parking spaces. 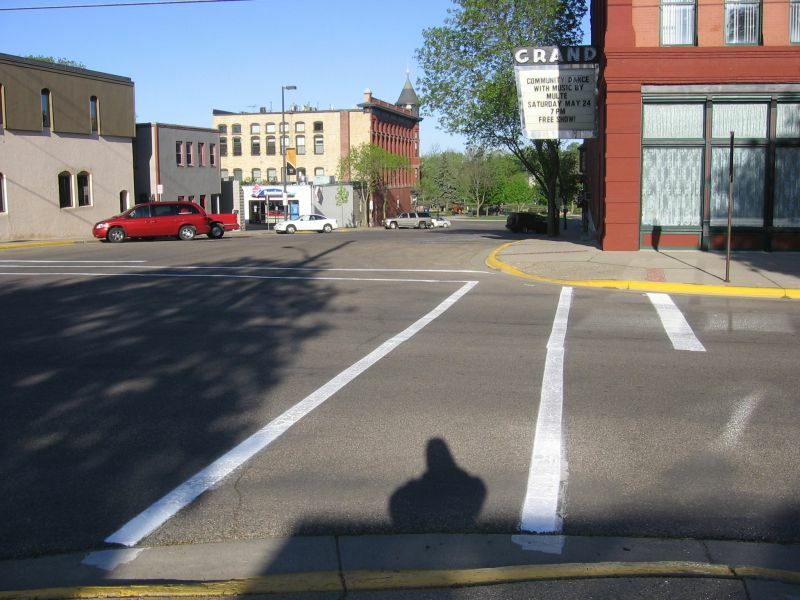 A few years ago, the NDDC’s E R Team made a request to the then City Engineer, Heidi Hamilton, that the annual “spring cleaning”, including repainting the crosswalks and parking spaces, be performed at the beginning of our season of visitors. She turned to newly-hired staff person (and now Director of Public Services) Joel Walinski and he said, without hesitation, “We can do that”. Well, Joel did it. And he continues, with his team, to get it done, every year, before the visitors arrive. Pictured is the corner of Washington and 4th, about 7 am this morning, May 21st, with a fresh coat of paint. St. Olaf’s Celebration Weekend is May 23rd through 25th, Northfield High School’s Graduation is May 31st, and Carleton’s Commencement Weekend is June 14th. So, here’s a Big Downtown Northfield Thanks to Joel Walinski and his team at the City of Northfield. Working together we’ll sustain our vibrant and vital downtown. I would echo Ross’s sentiments and add mine for the great job that Joel, T.J. and the whole Public Works staff do in rotating the downtown lightpole banners throughout the year. And there appears to be an extensive effort at curb repair going on this week. That ought to make Joe Grundhoefer smile.